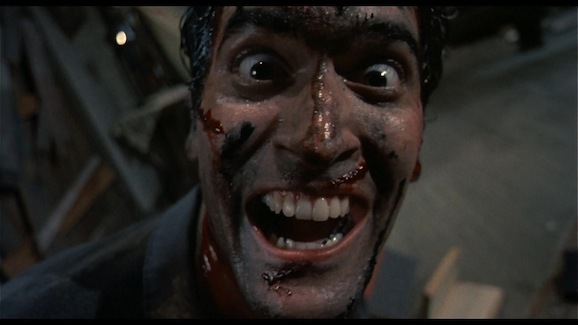 Strictly speaking, Sam Raimi’s Evil Dead movies may not be 100% science fiction, but that doesn’t mean they’re not awesome and that we don’t love them dearly. So much so that the prospect of a new series on Starz, with franchise stalwart Bruce Campbell revisiting his role of numbskull braggart Ash, is the best news we’ve heard in a long, long time. Ash vs. Evil Dead is already one of our most anticipated upcoming shows, and as we get closer and closer to it becoming a reality, we’re starting to learn more about it. At the recent Television Critics Association press tour, Starz head honcho Christ Albrecht talked to IGN about the new series, providing a few details, production news, and more. If you weren’t pumped, or at least getting pumped for this, you will be now. That’s promising. Campbell did say we can expect an “explosion of viscera,” which is going to be something that Starz can definitely provide (if you’ve ever watched an episode of Spartacus, you’ll know that blood geysers and the like are not out of the question at all). And if we know these guys at all, they can cram a whole lot of mayhem into half an hour. From what we’ve heard, it sounds like there is going to be a sizeable road trip element to the plot. The story picks up with a modern day Ash, and time has not been good to him since he battled the Deadites in Army of Darkness. He lives alone in a rundown trailer, working a dead end box store job similar to his gig at S-Mart, and has a serious PTST/survivor’s guilt thing going on. When an ancient evil rises again, he hits the road with two young co-workers, his boom stick, and hopefully his trusty chainsaw. The two other characters haven’t been cast yet, but Campbell described one as a male bonding kind of thing, while he’ll serve as a kind of father figure to the other as they try to pull him out of loner-Ash mode. That sounds groovy to us. Now to figure out how to get Starz on my TV before this happens.